In this study results of various simulation methods are evaluated used for design of experimental prototype rover. The proposed rover must satisfy requirements for operation in specific conditions. Simulation environment of V-REP software is used for verification of proper functionality of kinematics of the rover and for the draft of fundamental parameters. Deformation of beams are simulated in the Structure module of the software product PTC Creo and suspension system is verified in the Mechanics module in this software. 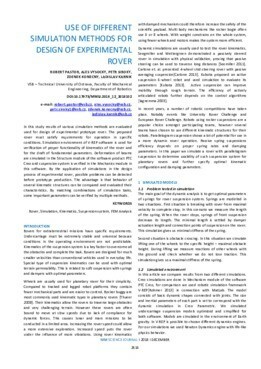 By the application of simulations in the design process of experimental rover, possible problems can be detected before prototype production. The advantage is that behavior of several kinematic structures can be compared and evaluated their characteristics. By matching combinations of simulation tasks, some important parameters can be verified by multiple methods.